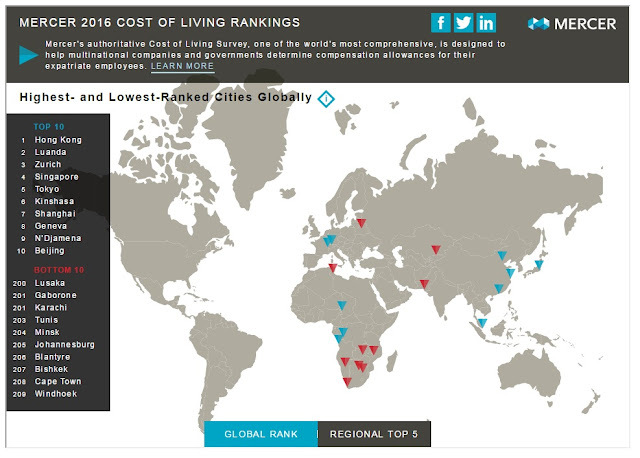 Asia has some of the most expensive cities to live in the world for expatriates, with Hong Kong topping Mercer’s annual Cost of Living Survey this year. Asia’s financial hub overtakes Angolan capital Luanda, which consistently topped the list in recent years, owing to the weakening of the African country’s local currency, according to the consulting firm in its press release. The survey ranks 209 cities across the world, comparing the cost of more than 200 items in each city, including housing, transport, food, clothing and entertainment. The survey is designed for companies to calculate fair allowances for expat workers. Switzerland’s largest city, Zurich, and Singapore were third and fourth on the list, unchanged from last year’s, and Japanese capital Tokyo rose to fifth. Half of the cities in the top 10 are in Asia. Check out the gallery to see which Asian cities are in the list.